Thinking of you and your family are concerned about your loved one�s health, Charras Natural Baked Tostadas offer a light, natural and delicious product. 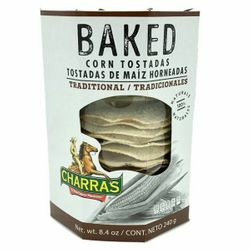 Baked Tostadas Charras undergo a special preparation process to maintain corn�s natural flavor and nutritional properties, guaranteeing 33% less calories than traditional tostadas. Try the real Mexican taste which has defined us for over 25 years and prove why the quality of our ingredients make Natural Baked Tostadas Charras the ideal choice for your family. Pensando en ti y en tu familia, preocupados por tu salud, Tostadas Horneadas Charras te ofrecen un producto ligero, natural y delicioso. Para la elaboraci�n de las Tostadas Horneadas Charras se utiliza un proceso especial de horneado que permite conservar el sabor natural y las propiedades nutricionales del ma�z, garantiz�ndole un 33% menos calor�as que las tostadas tradicionales. Prueba El Real Sabor Mexicano que nos ha caracterizado por m�s de 25 a�os ya que por la naturaleza y calidad de nuestros ingredientes, Tostadas Horneadas Charras �Es ideal para toda tu familia! They are tasty and help keep the calories low. I often bake my own corn tortillas to replace traditional fried chips. These already baked tostadas save me time and they taste great and are better for me. Love this product, my favorite snack, healthy and delicious. The authentic flavor of the mexican tortilla.